Kwanzaa is a week-long celebration annually celebrated from Dec. 26 through Jan. 1st, in the United States and other countries with populations of African descendants. 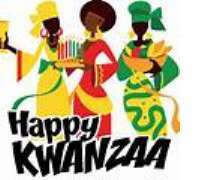 Kwanzaa does not have a religious base and is spiritual in nature. We live in a world and in a country rich in diversity. The diversity of holidays, cultures and religions is to be cherished and celebrated.